Last year I stumbled across a post by Dani from DIY Fatshion where she was taking part in a 30 x 30 challenge and decided to take my own turn. I really enjoyed doing the challenge and I've been thinking about redoing the challenge but I just haven't got round to it. I was thinking out loud on twitter last weekend and Toni, Laura and Mookie all asked more about the challenge and are also going to take part. Toni made our fab logo and I'm really looking forward to what we all come up with. I think that last time I was a bit too safe in my choices and this time I've gone for a few more patterns and prints so we'll see how I go. I have just noticed one of the dresses I've picked I choose last time so I might switch this for another item. 8 B&W Vest T-Shirt - New Look via ASOS Size 22 £? 13 Blue Cardie - ASDA Size 16 £? 14 Black Spotty Skirt - Yours Clothing Size 20 £? 16 Tartan Skirt - Pink Clove Size 22 £? 20 Grey Ring Neck Dress - Pink Clove Size 22 £? 21 Tartan Dress - Pink Clove Size 22 £? 23 Teal Dress - Peacocks Size 20 £? 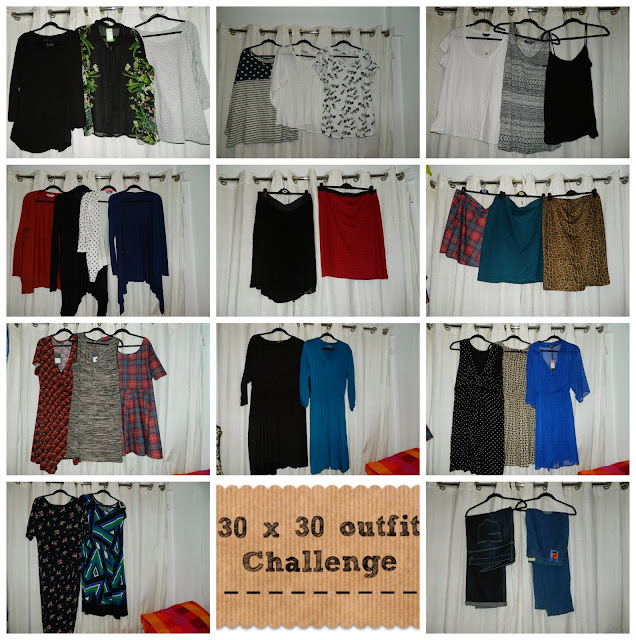 The aim of the challenge is to create 30 outfits from 30 items of clothes. There is no rush to complete the challenge but I'm hoping to do mine in approximately 30 days as I don't have a work uniform. What do you think of my choices? Have you ever done anything like this? Thank you, I've got outfit one post ready to go up tomorrow morning. Love the tartan dress,brilliant idea haven't heard of this before. Wow what a challenge! Looks like great fun! I love all your clothes and it's great if you're a student or you do a lot of travelling, you can take your wardrobe with you. I love the tartan dress!